The Best High-End Electric Guitars Under $1500 and $2000: reviewed and rated here! So you’ve finally decided to upgrade and are looking for the best electric guitar under $1500 and $2000. With those budgets, you definitely have a lot of fantastic pro-level guitars to choose from. By going up on the price tier you now have access to top models from the world’s most trusted brands including PRS, Gibson, Fender and Music Man. You can also be sure that the axe you’re getting won’t end up as kindling or as a mere display on the wall of your house. PRS S2 Custom 24 Electric Guitar The PRS S2 Custom 24 is a reimagined version of the original Custom 24. A new design with stripped-down features takes nothing away from the beauty and playability of the original. The S2 Custom 24 still has the same maple top and mahogany back, with the top having asymmetrical beveling. This electric guitar is equipped with 85/15 "S" pickups. 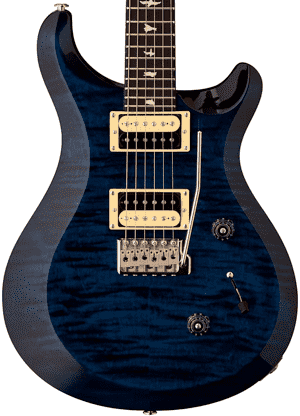 PRS S2 Singlecut Electric Guitar Our next recommendation is another PRS model. This time it’s the S2 Singlecut that makes the cut as one of the best electric guitars under $1500. This is somewhat of a controversial model - more on this later - but is still nonetheless worthy of any musician’s hard-earned money. The S2 Singlecut has that rich, warm tone of a mahogany-bodied electric guitar. Gibson Les Paul Tribute Electric Guitar Up next is the Gibson Les Paul Tribute, which is basically a tribute to vintage Les Paul electric guitars. The 2018 model faithfully captures the character of the original, from the use of tonewoods and tuners to the absence of any weight relief feature. It’s really like the Les Pauls of old, and you can get it for under $1000. Fender American Professional Telecaster Electric Guitar Of course there has to be a Tele here somewhere. 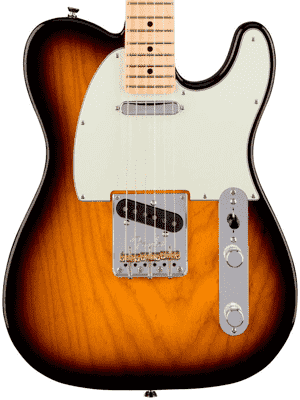 For this list we’re recommending the Fender American Professional Telecaster. This electric guitar features V-Mod single-coil pickups designed by Tim Shaw, Fender’s resident pickup guru. It also has a newly redesigned Tele bridge with compensated saddles, a new modern “Deep C” neck profile and a new treble-bleed tone circuit. The PRS S2 Custom 24 takes its styling from the Custom 24, the first electric guitar that Paul Reed Smith brought to the Winter NAMM (National Association of Music Merchants) show back in 1985. The flagship model has become one of the brand’s bestsellers. PRS has made the Custom 24 more accessible and in tune with the demands of modern players by coming up with the PRS S2 Custom 24. This reimagined model boasts a new aesthetic and stripped-down appointments but still retains the classic styling. You have the same body shape and wood combination of a maple top and mahogany back, with the maple top sporting asymmetrical beveling. The neck is made of mahogany and it’s topped with a rosewood fretboard with 24 frets. Unmistakable bird inlays that have long been the brand’s trademark serve as position markers on the fretboard. But the PRS S2 Custom 24 isn’t just visually appealing; it’s highly versatile as well, thanks to its 85/15 Zebra “S” bridge and neck pickups. Controls include a volume knob and a push/pull tone knob with a three-way blade pickup switch. Other specs include a molded PRS patented tremolo bridge and PRS low mass locking tuners. The PRS S2 Singlecut electric guitar features an all-mahogany body with an asymmetrical and beveled top, similar to the PRS S2 Custom 24. If you take a closer look at the shape however, you’ll see it shares a lot of similarities with the Gibson Les Paul. 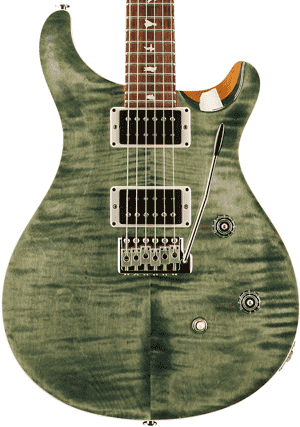 The first PRS Singlecut model was released in 2001. Soon after that, Gibson filed a lawsuit against Paul Reed Smith for trademark infringement. One judge ruled that the Singlecut was an imitation Gibson’s Les Paul guitar so PRS had to stop manufacturing it. The Court of Appeals reversed the decision and dismissed Gibson’s suit however, and PRS resumed production. This is what makes the Singlecut a controversial model. If you like that bit of info on the Singlecut, we recommend getting one! The PRS S2 Singlecut Standard Satin is a good choice with its mahogany body and neck, rosewood fretboard with 22 frets with dot inlays, #7 humbucking pickups, two push/pull tone controls and a three-way toggle switch. Low mass locking tuners ensure tuning stability all day and all night long. This electric guitar is incredibly versatile and has that classic vibe – perfect for demanding guitarists looking for a reliable and great-sounding instrument. The Gibson Les Paul Tribute is an homage to the legendary model and as such, seeks to capture the historic character and quality of the iconic Les Paul guitar. And it does, with its vintage styling and features, including its cream pickguard and PAF-inspired pickups. Let’s take a closer look at the 2018 Les Paul Tribute by Gibson. The 2018 Tribute features a mahogany body and a Slim Taper mahogany neck for a warm, focused sound and lots of sustain. The carved plain maple top adds sustain and adds just the right brightness and crispness to the vintage tone, delivered by a pair of 490R and 498T humbucking pickups. It has two volume and two tone controls as well as one toggle switch for tone shaping. The pickups take their inspiration from the classic PAF humbuckers first used on Gibson guitars back in the late ‘50s. The Gibson Les Paul Tribute also has a rosewood fingerboard with 22 cryogenically treated medium frets. Acrylic trapezoids serve as position markers. True to the original, the 2018 Les Paul Tribute offers no weight relief feature, which is just right for players who really want the playing feel of a vintage Les Paul. Fender took the best features of the iconic Telecaster and added some new stuff to come up with our next pick, the Fender American Professional Telecaster. This electric guitar features vintage-style pickups designed by Fender’s chief engineer Tim Shaw. When Shaw was asked to work on the pickups for the American Professional models, he thought about the alnico magnets, particularly how they sounded depending on their position. Shaw then came up with pickups that were specifically voiced according to position (bridge, middle, neck) and their purpose. On the American Standard Telecaster, you’ll find the Shaw-designed V-Mod Single-Coil Telecaster pickups on the neck and bridge positions. Both are custom-voiced and feature mixed alnico magnet types. Pickup switching is done via a three-position blade so you can easily tweak your output and choose between the bridge, bridge and neck and neck pickups. There is also a control for master tone and another for master volume with a new treble-bleed tone circuit. The Fender American Professional Tele has a lightweight alder body with a gloss polyurethane finish, a bright-sounding maple/rosewood neck with a modern yet comfortable “Deep C” profile and a smooth rosewood fingerboard with 22 narrow-tall frets and white dot inlays. 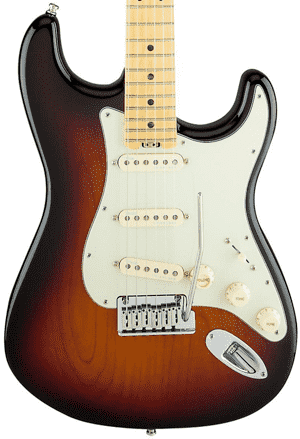 Fender American Elite Stratocaster Electric Guitar For under $2000, you can call the Fender American Elite Stratocaster your very own. Just like the Fender American Professional Telecaster, the Elite Strat is packed with modern upgrades. It’s got new Noiseless pickups, a new compound neck as well as a redesigned neck heel, a new adjustment wheel for the double action truss rod and even new control knobs. 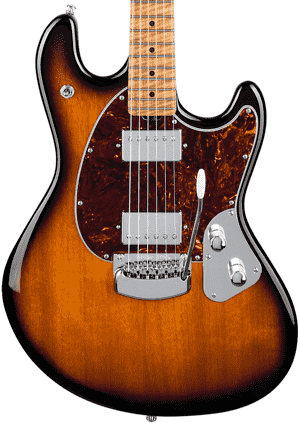 Music Man StingRay Electric Guitar Musicians with exacting standards have plenty of good words to say about the Music Man StingRay. That’s not surprising, considering the StingRay has long enjoyed a reputation for being a reliable, durable and downright awesome-sounding guitar. We’re recommending the Ernie Ball Music Man 2018 Stingray RS, which features an African mahogany body and custom humbuckers for a true vintage output. PRS CE 24 Electric Guitar PRS really does make seriously good guitars, which is why we’re including yet another PRS in this list. 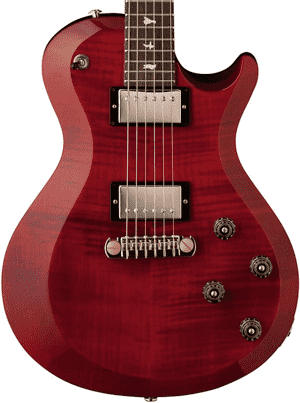 Our last pick for the category of best electric guitars under $2000 is the PRS CE 24. This model features a traditional bolt-on maple neck, a PRS patented molded tremolo and two PRS 85/15 pickups for maximum clarity and tonal variation. Not as wildly popular as the Tele or the Strat but just as revered, the Music Man StingRay proves to be one of the best electric guitars any serious musician would be proud to own. We’re looking at the Ernie Ball Music Man 2018 Stingray RS model in particular with its custom humbucking pickups and modern tremolo. This electric guitar boasts an offset lightweight body made of African mahogany with a high gloss polyester finish. The body works well with the sculpted neck made of roasted figured maple to produce a bright tone with a clear midrange and full sustain. The neck is finished with a hand-rubbed blend of gunstock oil and wax for a smooth playing feel. The fingerboard is made of either select maple or rosewood (depending on the body color) and it has 22 medium-width, high-profile stainless steel frets. Contributing to the sound quality of the StingRay RS is the pair of Ernie Ball Music Man HH-1 custom-wound humbuckers. A three-way toggle pickup selector allows players access to versatile coil combinations. This guitar also has a Music Man modern tremolo with vintage bent steel saddles. This is one good-looking and amazing-sounding electric guitar that’s worth the money. The last guitar and the one with the shortest, most unassuming name on this list is the PRS CE 24. The original CE (CE stands for “Classic Electric”) was introduced on 1988 and it was the first Paul Reed Smith guitar to feature a traditional bolt-on neck design. The CE 24 follows that tradition, sporting a bolt-on maple neck that provides a much-desired snap and response. The neck has a “Pattern Thin” carve and it’s given a sleek satin nitrocellulose finish for a fast and smooth playing feel. The CE 24 also has a figured maple top, a mahogany back and a rosewood fingerboard with the PRS bird inlays. The combination of tonewoods yields a bright tone with a clear and present midrange and excellent sustain. But all these would be for naught without the two PRS 85/15 pickups the CE 24 is fitted with. These humbucking pickups are designed by Paul Reed Smith himself and deliver remarkable clarity along with an extended high and low end to balance everything out. As for the controls, there are vintage-style control knobs for volume and tone (push/pull) with a three-way toggle switch. It also has a PRS-designed tremolo – neat, huh? The best electric guitars under $1500 and $2000 are usually targeted toward intermediate and experienced or semi-professional players. At this price point, guitars offer a better, or as some would say, a more specific sound that experienced players have developed to have a preference for. Electric guitar models in this price range are also made of better-quality materials and boast structural and cosmetic appointments you won’t find in entry-level guitars. These features are designed to meet the needs and expectations of players who feel their starter guitar no longer matches their advanced skills. For intermediate and advanced players, the options are 1) upgrade parts such as the components, electronics and hardware of their guitar and 2) buy a new guitar with the much-desired features and sound. When is it time to ditch #1 in favor of #2? Before we answer that, let’s consider the most common upgrades done on an electric guitar. ● New pickups – changing the pickups is an easy way to improve the sound of an electric guitar without changing anything else. A different set of pickups can increase an electric guitar’s tonal range, clarity and overall ability to ‘pick up’ vibrations from the guitar. ● New components – components such as switches, knobs, tuning machines, floating tremolos, wiring, nuts, bridge saddles and others can also be changed to improve the playability, performance and the looks of a guitar. These parts can become loose over time, especially on inexpensive entry-level instruments where build and durability are usually a concern. ● New neck – when your frets have worn down, if your guitar’s neck has cracked or you simply want to feel like you have a new guitar in your hands, you can consider replacing the neck, which is easy to do if your guitar has a bolt-on neck. For musicians who rely on their guitar on a daily basis, this is the quickest way to get their guitar fixed up without buying a new guitar or waiting to have the neck refretted or fixed by a luthier. Why do guitar players choose to upgrade parts of their instrument instead of making a new purchase? Well, one factor is cost. If you’re a student or a working musician, buying a new guitar straightaway may be out of the question because of budgetary limits. However, a few upgrades wouldn’t hurt, especially if you do them one at a time – pickups first for this month, tuners and control knobs the next month and so on. Another reason is sentimental value. Many guitar players sell off their starter instrument so they can get funds for a new one, but some don’t want to let go of their first baby for a host of reasons: it was a gift from their parents, it was the first major expense they paid for with their own money, they’ve already done several customizations on it or what have you. In short, they would rather keep working with their old guitar. Guitar players have different reasons for upgrading or buying a new axe. If you can’t decide just yet, take your budget into consideration. Examine the cost of each of the upgrades you want to do on your guitar, along with the cost of servicing or taking it to a luthier. 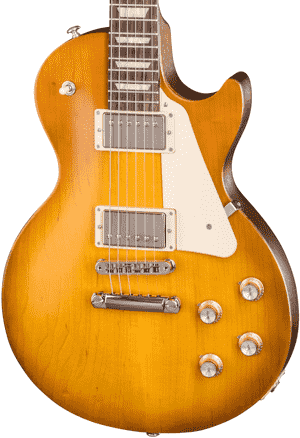 Compare the overall cost to the cost of buying a new electric guitar. If doing the upgrades turns out to be more cost-effective, go ahead and do those. However, if a new instrument costs just a little more, consider investing in a new guitar instead. Other than cost, here are other reasons why a new guitar is in order. – When upgrading pickups don’t work, maybe it’s the overall construction of the guitar that’s keeping you from getting the sound you want. It’s time to look for a new axe – there are many options you can explore, such as the ones we’ve listed above. – As you advance in skills and develop a taste for a particular tone, you will also grow to appreciate the specs and nuances of a more expensive instrument with higher-quality tonewoods and materials. You will not only hear but also feel the difference between your starter instrument and a potential new guitar. – If you’re serious about your music, a guitar that matches your playing style and abilities would be the best one for you. This is a better option than you having to adjust your playing to what your current guitar can do. – If your old guitar doesn’t spark joy anymore – of if it doesn’t motivate you to practice, no matter how much you upgrade its parts – then consider looking for a new one. Sell off your guitar if you don’t mind doing that, and add this to your ‘new guitar’ fund. All in all, what’s important is that you have a guitar that inspires you and keeps you motivated to learn. The more you learn and improve your skills, the more you’ll grow as a musician. For many, this can simply be an upgrade to their tone via new pickups, for others, it’s a completely new axe. Reflect on what you need and want from your guitar, how serious you are about your music and how much you’re willing to spend on your sound. Whatever you decide on – whether it’s a new floating tremolo or a new guitar – is all good as long as you keep on playing.